As one of the world�s leading internationally acclaimed underwater photographers with compact cameras, Alex Wu has gained over 18 international awards and recognition from prestigious underwater film festivals and photo contests around the world. His work has been broadcasted, published in magazines and exhibited in many countries. All his underwater photography has been produced only from digital compact cameras. For more info on Alex Wu and his work, visit his website. Thanks to new technology which has brought us a long way from the film days, even phones nowadays have cameras that take pictures comparable to some cameras...and with more then enough pixels to fill a laptop screen which equals only about 1 megapixel versus to the 12 megapixels of the DC1200. The real challenge for many camera owners is to figure out how to take advantage of the new technology. With SeaLife's purpose built UW camera, the DC1200 takes out a lot of this guess work and fuss with its uniquely simplified menu system and UW housing designed for the diving photo hobbyist. 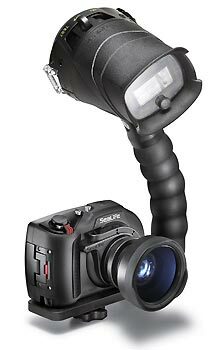 The most unique part of the DC1200 is its integrated menu functions for shooting UW be it with or without strobes. Even though most cameras have an an UW scene mode - which is essentially just a preset white balance setting - most of them are programmed for snorkeling rather than the deeper depths of diving, so often most UW scene modes still yield bluish or greenish photos. Not only does the DC1200 have a similar snorkel scene mode but also presets for 4 different diving conditions (deep/shallow blue water & deep/shallow green water), but it also leads the user through them with each successive button push in its menu for even the most un-technically inclined point-and-shooter. For the more technically inclined, you can also choose to manually set your White Balance for all your different diving scenarios and get even more accurate colors when diving. On the same menu clicking path is also the setting for shooting with the SeaLife Digital Pro (UW) Flash. Setup for close-up to macro photography, this again takes all the fuss out making it a no-brainer setup. Again, for those who are more inclined or progressed to use strobes to take you UW photography to a higher level the camera still allows you to take control of the aperture and shutter to achieve the creative results during your scuba adventures and with a little bit of knowledge on photography basics, this camera's full potential can be achieved. After some of my testing with the equipment and with the results that I achieved, this setup certainly has more potential than just a point-and-shoot UW camera. Next up in design are the "piano keys"...and no it'a not an UW jukebox, it's just the type of buttons the housing uses which resembles the keys of a piano. This new design keeps the layout simple and fully accessible even for gloved divers. Surprisingly, the housing has only 8 buttons (Shutter, On/Off, Play, Menu, Delete, Flash/right, Focus/down, Mode/Video) & the zoom lever which were all accessible with one hand whilst holding onto the fully rubberized housing giving good grip & protection against tank banging bumps. Cleverly, the designers have made the zoom lever also function as the navigation controls once in the camera's menu system and the shutter button as the "Enter/Set" button. This I found, keeps the fingers & camera handling to a minimum since the index finger is very naturally positioned next to both the zoom lever & shutter button most of the time and my thumb over the piano keys. With such simplicity in operation, this configuration will let you focus your attention on the safety of the environment, yourself & your subject whilst composing your shot too. To see some of the results I have been getting with the Sealife DC1200 Elite kit have a look at the Sealife DC1200 underwater images gallery on my website. The nicest part of the Elite package which surprisingly is not mentioned on their website (see below for the full list) is that the package comes with all the bits and bobs that if you had a name brand setup, you'd have to figure out what you needed and find yourself - and we all know what time is worth! Money! From lens wipes, lens covers, silica gel packets (used to dehumidify the inside of the housing to keep it from fogging up inside) to a� tray and arm for a strobe and more. It even included various international adaptors so that I didn't need to worry about charging issues at my next fabulous dive location. Even the strobe adaptor had room for a second sync cord port! All in all, a very well thought out package delivered in a fully padded travel case ready to go at a moments notice or ready to show on your seaside room's widescreen TV! To meet and learn from Alex Wu himself you can now sign up to attend the Compact Camera Workshops held in Byron Bay, Australia from the 2nd until the 11th of September. Alex will help you get the best shots for the Underwater Festival shootout and increase your chance of winning one of the amazing prizes totalling close to $150,000!! !